Portugal week 2 and a lovely last minute commission! As promised, here's the link to the newly added second week residential felting extravaganza at Dominio Vale do Mondego in Portugal this June. I've also updated the workshop page here on the website to reflect everything that is happening over the next few months, currently I'm planning a trip to teach in Canada again this Autumn so if you're interested please shout out loud now and email me. I don't plan an instant reply (with my impending trip to Texas, California, Michigan and Kentucky happening this week it's full steam ahead as usual at Clasheen) but I do promise to respond as soon as my feet hit the ground!!! On Thursday last week I got a lovely last minute commission to felt a baby's blanket. This will be used as the base for an embellished family tree and will also be displayed at Nadia's wedding at the end of May. Thanks Nadia for such a charming request, I can't wait to see how you stitch or print the names of your family members to the tree! Here's a picture of the completed piece as it left my studio this afternoon. 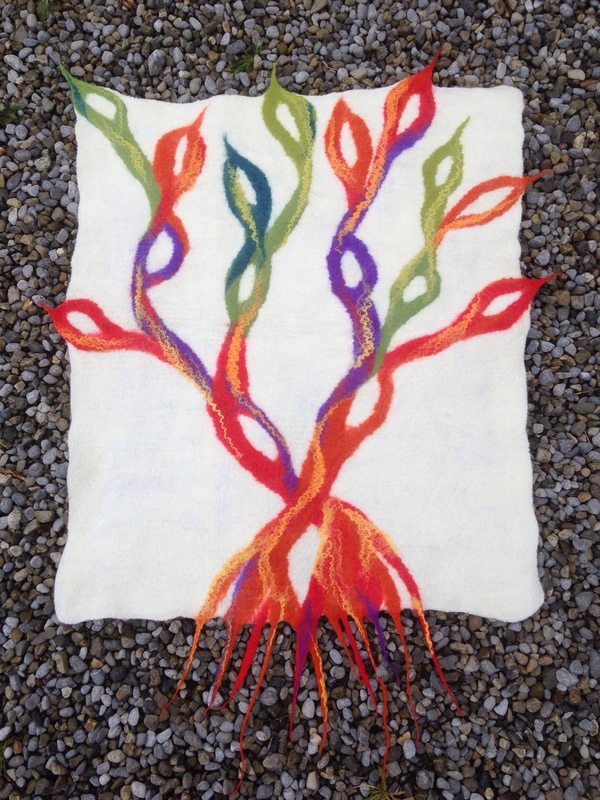 This entry was posted in Portugal 2014 and tagged 27th September, family tree, Felt, Portugal, residential felting classes, residential felting workshop by Nicola. Bookmark the permalink. What an amazing idea! What did you use as a base? What are the dimensions? Love it! By the way I learned you are going to be in my neck of the woods at the Tin Thimble soon! Unfortunately, this isn’t something I will be able to make this time, but I’m going to keep my eyes peeled for your next visit. Love your work. Nadia was the brain behind this piece! It’s all felted from 19.5 micron merino, the base is two layers of white and I laid a generous amount of silk fibre on top to add another dimension. Hope to see you in a The Tin thimble another time!!! Lovely idea and piece.Happy trails, Nicola!